Georges Claude (24 September 1870 – 23 May 1960) was a French engineer and inventor. He is noted for his early work on the industrial liquefaction of air, for the invention and commercialization of neon lighting, and for a large experiment on generating energy by pumping cold seawater up from the depths. He has been considered by some to be "the Edison of France". Claude was an active collaborator with the German occupiers of France during the Second World War, for which he was imprisoned in 1945 and stripped of his honors. Georges Claude studied at the École supérieure de physique et de chimie industrielles de la ville de Paris (ESPCI). He then held several positions. He was an electrical inspector in a cable factory and the laboratory manager in an electric works. He founded and edited a magazine, L'Étincelle Électrique (The Electric Spark); his important friendship with Jacques-Arsène d'Arsonval apparently dates from this time. About 1896, Claude learned of the explosion risk for bottled acetylene, which was used at the time for lighting. Acetylene is explosive when stored under pressure. Claude showed that acetylene dissolved well in acetone, equivalent to storing it under 25 atmospheres of pressure, reduced the risk in handling the gas. In 1902 Claude devised what is now known as the Claude system for liquifying air. The system enabled the production of industrial quantities of liquid nitrogen, oxygen, and argon; Claude's approach competed successfully with the earlier system of Carl von Linde (1895). Claude and businessman Paul Delorme founded L'Air Liquide, S.A. (Air Liquide), which is presently a large multinational corporation headquartered in Paris, France. Inspired by Geissler tubes and by Daniel McFarlan Moore's invention of a nitrogen-based light (the "Moore tube"), Claude developed neon tube lighting to exploit the neon that was produced as a byproduct of his air liquefaction business. These were all "glow discharge" tubes that generate light when an electric current is passed through the rarefied gas within the tube. Claude's first public demonstration of a large neon light was at the Paris Motor Show (Salon de l'Automobile et du Cycle), 3–18 December 1910. Claude's first patent filing for his technologies in France was on 7 March 1910. 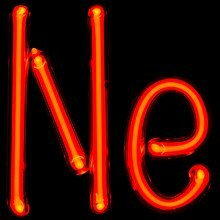 Claude himself wrote in 1913 that, in addition to a source of neon gas, there were two principal inventions that made neon lighting practicable. First were his methods for purifying the neon (or other inert gases such as argon). 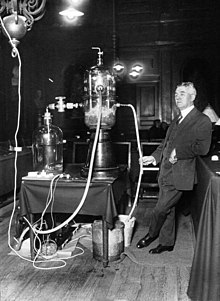 Claude developed techniques for purifying the inert gases within a completely sealed glass tube, which distinguished neon tube lighting from the Moore tubes; the latter had a device for replenishing the nitrogen or carbon dioxide gases within the tube. The second invention was ultimately crucial for the development of the Claude lighting business; it was a design for minimizing the degradation (by "sputtering") of the electrodes that transfer electric current from the external power supply to the glowing gases within the sign. Claude's mentor and friend was Jacques-Arsène d'Arsonval, the inventor of the "Ocean Thermal Energy Conversion" (OTEC) concept. Claude was also the first person to build prototype plants of that technology. Claude built his plant in Cuba in 1930. The system produced 22 kilowatts of electricity with a low-pressure turbine. Even as a young engineer, Claude was unsympathetic to democratic rule. In 1933 he joined the Action française, which favored restoration of a monarchy in France. He was a close friend of the monarchist leader Charles Maurras. Following the 1940 defeat of France by Germany at the beginning of the Second World War, the subsequent German occupation of northern France and establishment of the Vichy regime in the south, Claude publicly supported French collaboration with Germany. Among his other activities, he published several tracts supporting collaboration. He was a member of a Distinguished Committee of the Groupe Collaboration, which had been founded in September, 1940. He was nominated by the Vichy regime as a member of the Conseil National Consultatif in 1941. Following the Allied liberation of France in 1944, Claude was taken into custody on 2 December 1944 because of his collaboration with the Axis Powers. He was removed from the French Academy of Sciences. In 1945 he was tried and convicted of propaganda work favoring collaboration, but was cleared of another charge that he helped design the V-1 flying bomb. He was condemned to life imprisonment, and was imprisoned. In 1950 he was released from prison, with acknowledgment of his research on ocean thermal energy conversion. Claude wrote several semi-popular descriptions of his research, in addition to his wartime tracts and a memoir. L'Électricité à la portée de tout le monde. Vve C. Dunod. 1901. Claude's first book, Electricity Made Accessible to Everyone, was a very popular exposition. It won the Prix Hébert de l’Académie des Sciences, and was translated into German. Christine Blondel writes of it, "In fact the success of the book was enormous. More than 60,000 copies were sold, nearly double the number of Jean Perrin's famous book, Les atomes." L'air liquide, sa production, ses propriétés, ses applications. Préface de d'Arsonval. Vve. C. Dunod. 1903. Liquid Air: Its production, its properties, and its applications, published shortly after the founding of Air Liquide. Liquid air, oxygen, nitrogen. Introduction by d'Arsonval. P. Blakiston's Son & Co. 1913. Translated by Henry E. P. Cottrell from Air liquide, oxygène, azote. Préface de d'Arsonval. H. Dunod et E. Pinat. 1909. Sur l'utilisation de l'énergie thermique des mers. Institut Océanographique. 1926. . Bulletin, No. 486. On the Utilization of the thermal energy of the seas. Ma bataille contre la vie chère. A. Fayard. 1939. My Battle Against the High Cost of Living. La vie chère literally refers to "dear life" (expensive living). It was an obsession of interwar France (1919–1939). Ma vie et mes inventions. Plon. 1957. My Life and My Inventions, Claude's autobiography, published a few years before his death in 1960. ^ a b c "Georges Claude, Inventor, Dies; Creator of Neon Light was 89". The New York Times. May 24, 1960. p. 37. Paid access. ^ a b c "FRANCE: Paranoia?". Time Magazine. July 9, 1945. ^ a b Chiles, James (Winter 2009). "The Other Renewable Energy". Invention and Technology. 23 (4): 24–35. Archived from the original on 2009-12-02. ^ a b Venner, Dominique (2000). Histoire de la collaboration [History of the Collaboration] (in French). Pygmalion-Gérard Watelet. ISBN 978-2-85704-642-4. ^ "ESPCI ParisTech Alumni 1889". ^ a b c Blondel, Christine (1985). "Industrial science as a "show": A case study of Georges Claude". In Shinn, Terry; Whitley, Richard (eds.). Expository Science: Forms and Functions of Popularisation. D. Reidel. p. 251. ISBN 978-90-277-1831-0. ^ Almqvist, Ebbe (2003). History of industrial gases. Springer. p. 242. ISBN 978-0-306-47277-0. ^ Greenwood, Harold Cecil (1919). Industrial Gases. D. Van Nostrand. p. 87. ^ Iqbal, S. A. (2005). Physical Chemistry. Discovery Publishing House. p. 42. ISBN 978-81-7141-994-4. ^ a b Claude, Georges (November 1913). "The Development of Neon Tubes". The Engineering Magazine: 271–274. ^ There is, as yet, no satisfactory primary source to the actual date on which Claude unveiled his neon lights at the 1910 Paris Motor Show. Many references give 3 December 1910, which was the starting date for the show. See Robertson, Patrick (1974). The book of firsts. C. N. Potter. and also the Motor Show poster. Others give 11 December; see Bloom, Ken (2004). Broadway: its history, people, and places : an encyclopedia. Taylor & Francis. ISBN 978-0-415-93704-7. .
^ Testelin, Xavier. "Reportage – Il était une fois le néon No. 402" (in French). Retrieved 2010-12-06. Claude's 1910 demonstration of neon lighting lit the peristyle of the Grand Palais in Paris; this webpage includes a recent photograph that gives an impression of it. It is part of an extensive selection of images of neon lighting; see "Reportage – Il était une fois le néon". ^ ‹See Tfd›US 1125476, ‹See Tfd›Georges Claude, "Systems of Illuminating by Luminescent Tubes", issued 1915-01-19 See reproduction of patent. ^ "Claude Neon Lights Wins Injunction Suit: Also Gets Rights to Recover Profits and Damages Resulting From Patent Infringement". The New York Times. November 28, 1928. Paid access. ^ Saillant, Catherine (2013-12-03). "Pair sheds new light on L.A.'s claim to neon fame". Los Angeles Times. Retrieved 2018-09-23. ^ Fontani, Marco; Costa, Mariagrazia; Orna, Mary Virginia (1 October 2014). The Lost Elements: The Periodic Table's Shadow Side. Oxford University Press. p. 287. ISBN 9780199383368. Retrieved 23 September 2018. ^ a b Takahashi, Masayuki Mac (2000) . "2. Ocean Water and Its Wonderful Potential" (PDF). Deep Ocean Water as Our Next Natural Resource. Translated by Kitazawa, Kazuhiro; Snowden, Paul. Tokyo, Japan: Terra Scientific Publishing Company. ISBN 978-4-88704-125-7. ^ Claude, Georges (1941). Histoire d'une évolution: de l'hostilité à la collaboration [History of an Evolution: On Hostility Against Collaboration] (in French). Les Éditions de France. ^ Claude, Georges (1942). La seule route [The Only Route] (in French). Inter-France. ^ Claude, Georges; Vuillermoz, Émile (1943). Français, il faut comprendre! [France! You Must Understand!] (in French). L. Hardy. ^ Paxton, Robert O. (1997). French peasant fascism: Henry Dorgère's Greenshirts and the crises of French agriculture, 1929–1939. Oxford University Press. p. 33. ISBN 978-0-19-511189-7. Baillot, Rémy (2010). Georges Claude : Le génie fourvoyé. EDP SCIENCES. ISBN 978-2-7598-0396-5. The French title translates loosely as Genius Gone Astray; Baillot's appears to be the only book-length biography of Claude. U.S. Patent 1,125,476, Improvements in Systems of Illuminating by Luminescent Tubes. Jan 19, 1915.